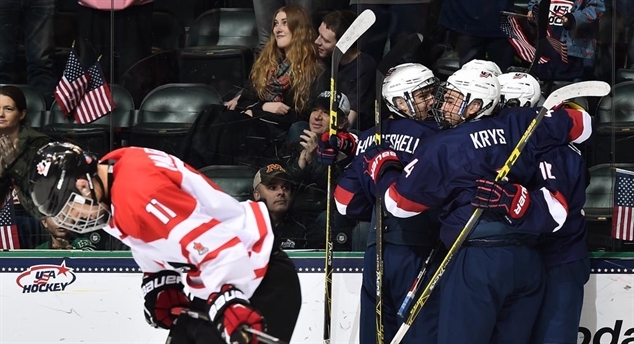 Reichel’s lasting legacy Robert Reichel’s team is out of the IIHF U18 World Championship in Grand Forks. Yet the Czech coach’s impact goes far beyond this tournament. Lindstrom the shootout hero Linus Lindstrom scored the shootout winner as Sweden beat Canada 6-5 in the late semi-final. The Swedes will face neighboring rival Finland for gold on Sunday. Finns dethrone U.S. In a tense semi-final, Finland upset the host U.S. 4-2 to make the gold medal game. Aapeli Rasanen scored twice, including the winner with 37 seconds left. Welcome to the Final Four If everything goes according to form in Saturday’s semi-finals, we’ll see an all-North American gold medal game and an all-Nordic bronze medal game on Sunday. Denmark strikes back With a 4-1 win over Latvia, Denmark tied the best-of-three relegation series at one game apiece. The deciding game goes Sunday at the Ralph Engelstad Arena. For Whom The Bell Tolvanens Eeli Tolvanen got a hat trick to lead Finland to a 4-3 quarter-final win over Russia. Ukko-Pekka Luukkonen debuted in goal since starter Leevi Laakso was sick.